Peppers (red and yellow) — 2 PCs. 1. Prepare the ingredients. Rice noodles in a pot with boiling water. 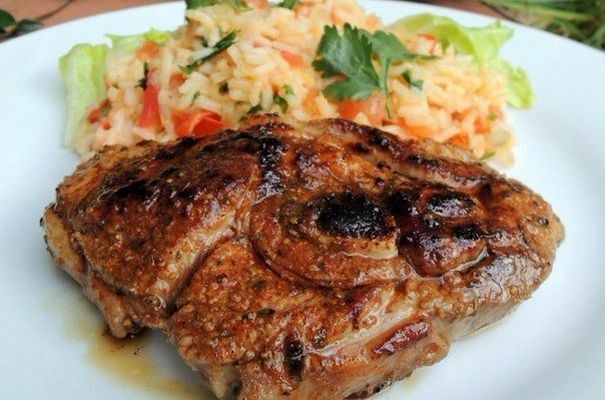 Cook until tender and rinse in cold water. 2. 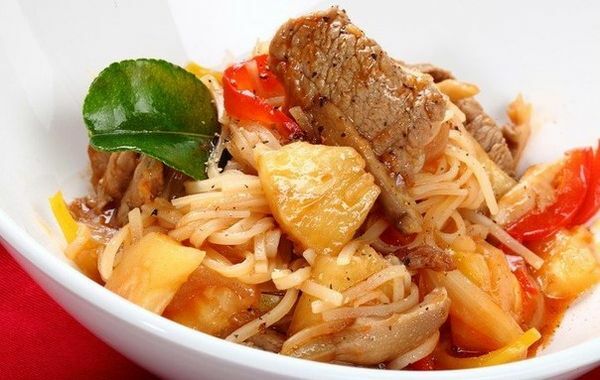 Vegetables and mushrooms cut into strips, pineapple — cubes. Garlic and ginger RUB on a small grater. 3. Meat cut into thin strips. 4. In a pan pour oil, for 2-3 minutes to brown the meat, then put on a rack or towel to drip off excess fat. In the same oil fry the garlic and ginger, then add mushrooms and vegetables. 5. At the end of cooking add the chopped pineapple and fry for another 3-5 minutes. Add the tomato patsos, soy sauce and lemon juice. For a more pronounced sour-sweet taste, add syrup from canned pineapples. 6. To ready the vegetables, add the meat and pre-cooked rice noodles and mix well. 7. Pour onto a plate.